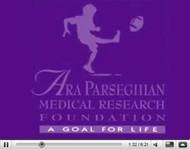 We invite you to read our newsletter, "A Goal For Life", which provides quick and easy access to information about what's new at Ara Parseghian Medical Research Foundation, research updates, fundraising stories and features about NP-C patients and families. To the left, you can view videos that include messages from Cindy Parseghian and an interview with Ara Parseghian. We are pleased to announce a new partnership with the University of Notre Dame which will help toensure APMRF’s momentum in pursuing a treatment for Niemann Pick Type–C disease. Notre Dame has launched the Ara Parseghian Medical Research Fund which will take on the administrative functions of the APMRF including fundraising, recruiting of researchers world-wide, grant administration, marketing, interaction with other NP-C families, and hosting of the annual science conference. The Parseghian family will continue to be intimately involved with the fundraising efforts and will act as advisors to the new Fund. A great deal of attention has been focused on this transition to ensure that the work we started over 22 years ago continues advancing the field of NP-C research. Ed Holson, Ph.D., Entrepreneur in Residence and Chief Scientiﬁc Oﬃcer at KDAC Therapeutics. Dan S. Ory, M.D., Director, Washington University Metabolomics Facility, Washington University School of Medicine. Suzanne Pfeﬀer, Ph.D., Emma Pfeiﬀer Merner Professor of Medical Sciences and the Professor and Chairman of Biochemistry, Stanford University. Established in 2009, The Notre Dame Center for Rare & Neglected Diseases was recently named and dedicated to two families with longtime ties to the University of Notre Dame – The Boler Family and the Parseghian Family. The Boler family made a generous gift to ND to endow the Center and chose to name it in honor of their parents John and Mary Jo Boler and Michael, Marcia and Christa Parseghian,the children of Mike and Cindy Parseghian. The University of Notre Dame hosted the 20th NP-C Science Conference in June, bringing researchers from around the world to discuss the progress in NP-C research. This conference was made possible by an endowment the APMRF established to ensure the continuation of this very important meeting. It is the only large meeting specifically held for NP-C researchers so they can focus their attention on conquering the disease. The attendees also help formulate the plans for the direction of the research, highlighting special areas to be investigated. Tremendous progress has been made to initiate a new, two-center drug trial later this year at the Mayo Clinic and NIH Clinical Center. To reach this goal a major collaborative effort is underway to determine if a histone deacetylase inhibitor (HDACi) can be used to safely treat patients with Niemann-Pick Disease, type C1 (NPC). A clinical trial is expected to begin in the summer of 2014 using a Histone Deacetylase Inhibitors (HDACi). The goal of the Phase 1 clinical trial will be to establish the safety and tolerability of an oral HDACi as a treatment for NPC1 disease. Surrounded by the splendid beauty of Pebble Beach, this three day event held on June 21st-24th, was spectacular! Participants enjoyed rounds of golf on The Pebble Beach Golf Links and The Links at Spanish Bay, the camaraderie of old friends, new acquaintances, delicious cuisine, and a Sunday evening to remember. The evening’s special guests included Amanda Bane and her family. 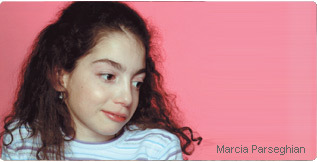 Amanda, age 21, was diagnosed with NP-C two years ago.